When will be Car Hunters next episode air date? Is Car Hunters renewed or cancelled? Where to countdown Car Hunters air dates? Is Car Hunters worth watching? Car Hunters follows individuals as they passionately search for their dream car. In each episode we follow a new buyer, aided by a friend or family member, as they check out three unique vehicles and hit the open road for a test drive. We share in the exhilaration and deliberation as they try to decide which ride they will cruise home in. Featured buyers include an empty nester who wants to recapture his youth with a car from his glory days; a father and son duo who are on the hunt for a thrill ride to bond over; a former correctional officer looking to kick off his retirement in style by owning a classic convertible; and a life-long lover of iconic low-riders who's looking to finally buy one of his own! Sonny Recla is a Dallas firefighter with a true love for classic cars, and he's looking for a new ride to cruise around town in. On his hunt, he test drives a beautiful but compact '55 Ford Thunderbird, a '75 Oldsmobile Hurst with plenty of power, and a stunning '64 Chevy Impala. With three great rides to pick from, Sonny's got a tough decision on his hands. Suzi Fife is a busy mom who's looking for a cool sports utility vehicle to remind her of her childhood days on a farm. Along the way, she checks out a '78 International Harvester Scout II with vintage appeal, a souped up '70 Ford Bronco with a 3-speed transmission, and a '75 Land Rover Series III that's classic all the way. But which one will best bring her back to her rural roots? Jimmy Kent has been in love with cars since he was a teenager, and now he's in the market for a classic sports car that's also be a smart investment. On his hunt, he test drives an iconic '66 Shelby Cobra replica, a rare '73 De Tomaso Pantera, and a timeless '87 Ferrari 328 GTS. But which ride will give Jimmy the most bang for his buck? Growing up around his father's hotrods, Clint Hrabal always dreamed of owning one of his own. His search puts him behind the wheel of a classic '34 Ford Pickup hotrod with a huge engine, a '46 Ford Tudor with some serious mobster style, and a '70 Chevy Camaro that packs a mean punch. But faced with three such unique hotrods, which one will have Clint burning rubber in his father's tracks? 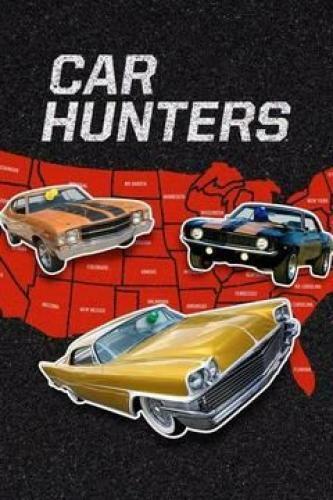 Car Hunters next episode air date provides TVMaze for you. EpisoDate.com is your TV show guide to Countdown Car Hunters Episode Air Dates and to stay in touch with Car Hunters next episode Air Date and your others favorite TV Shows. Add the shows you like to a "Watchlist" and let the site take it from there.